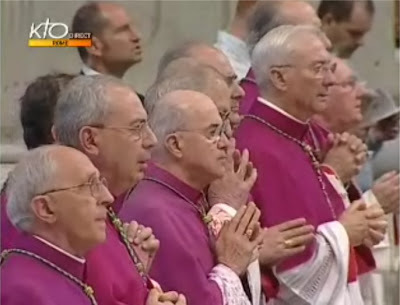 I have been watching some of the Holy Father's Pentecost Mass at St Peter's on the completely excellent KTO TV. 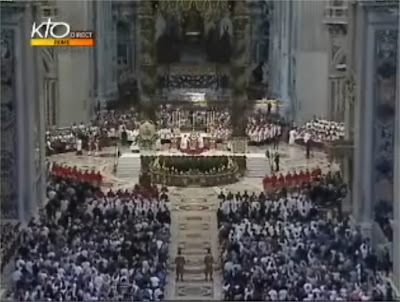 The above screenshot gives an impression of the Papal Liturgy as it is celebrated by Pope Benedict out of preference inside the Basilica rather than in the Piazza. I am afraid that I got carried away with liturgical minutiae but I know that at least some of you won't mind that! You can see that the Holy Father knows the text of the Confiteor in the newer form off by heart (he scarcely looks at the book.) This would indicate that he usually says the Novus Ordo at private Masses: if you regularly celebrate in the usus antiquior you have to check the text for the newer form. The Mass was Haydn's beautiful Harmonienmesse as I mentioned the other day. One of the great things about the KTO coverage is that you can listen to this in full and see shots of the conductor, soloists, choir and orchestra. The Mass highlighted some of the problems with using a polyphonic setting in the Novus Ordo. The Kyrie is almost nine minutes long and the Sanctus nearly eight minutes. In both cases, the action of the Mass just stops until the piece is sung. In the usus antiquior, you can continue with the rite, perhaps at a more leisurely and meditative pace than is the case for a plainchant setting. The Holy Father sat for both the Kyrie and the Gloria so I think we can take it that it is OK to do that in the new rite. Again, there is an advantage in the older form where the celebrant and the sacred ministers recite the words before sitting down. Interestingly, the singing of the Agnus Dei was postponed until the Holy Communion of the faithful. In the older form, there is the opportunity for the celebrant to say the prayers of preparation for Holy Communion more slowly than usual while the text is being sung. In these various ways, the Mass shows some possibilities for "mutual enrichment" by way of permission. With a polyphonic Mass, it makes sense for the prayers at the foot of the altar and the priest's communion to be celebrated in the traditional manner even if the rest of the Mass is celebrated according to the Novus Ordo. Then there is the suggestions made by Cardinal Ratzinger on more than one occasion that the Canon could be said quietly. On such a grand occasion as the Pentecost Mass in St Peter's, this would help to provide an oasis of meditative calm at the heart of the Mass. Archbishop: "Bloggers not part of the Church"
Hermeneutic hits Gloria TV News! Incense drill and "spin the biretta"
Opening up the question of Vatican II? Bishop O'Donoghue attacks "conspiracy of silence"
Launch of "A Pure Heart Create for Me"
"... this blog is now a Roman Catholic blog..."
"This is bigger than you are"
You ain't seen me - right? Equality Bill and "just cross-dressing part-time"